We had a fant­astic talk about inter­na­tional com­mu­nic­a­tions from the speaker’s own per­spect­ive as a tech­nical pro­gramme man­ager for a major mul­tina­tional com­pany which is respons­ible for large pro­por­tion of global inter­net traffic. Rob heads the company’s data centre inter­na­tion­ally. After Tapton school and a degree from Salford University, he worked for BT Global Services, Bovis (as part of the team devel­op­ing Meadowhall and the Manchester Arena) and, more recently, as IT Director for phar­ma­ceut­ical com­pany Wyeth before moving to California. A real Sheffield suc­cess story! The first transat­lantic sub­mar­ine tele­phone cable was laid in 1858 but it was a cen­tury later before a con­nec­tion was estab­lished across the Pacific. The world’s first tele­gram was sent by Queen Victoria to the USA pres­id­ent in 1868. The dif­fer­ence now is a fibre optic cable repla­cing the 19th cen­tury copper core insu­lated by a fat seal­ant, rein­forced and made water­tight at great depth by steel, hes­sian and tar. The Reliance: tansoceanic cable ship. The web­site www.vesselfinder.com gives real-time pos­i­tion­ing of any ship­ping. Try find­ing where Reliance is at this moment. Submarine cables are pre­ferred to satel­lite for tele­com­mu­nic­a­tions because of far greater trans­mis­sion speeds (100ms latency) and the need for two-way traffic. Sky, on the other hand, needs just one-way traffic for global TV trans­mis­sion, and satel­lite is ideal. The 600ms latency for TV doesn’t matter. Light travels very fast through glass (100ms across the Atlantic through fibre optic cable) and is ten times quicker than by satel­lite, where much greater dis­tances through space are involved. Bandwidth denotes capa­city (think of the impact the number of motor­way lanes has on traffic flow). Internet traffic is grow­ing by 2 per cent per annum and will have doubled by 2021. At present 4.3 mil­lion YouTube videos, and nearly 4m WhatsApp mes­sages shoot round the globe every minute of the day! Extra capa­city is needed (and being planned) for 50 per cent of the rest of the world not yet con­nec­ted to the inter­net (per­haps wor­ry­ing when you think how ancient cul­tures were changed for ever once “civil­isa­tion” intruded … Tahitians, Sub-Saharan Africans, Aborigines, Indigenous Americans etc, etc). There are numer­ous con­straints to laying under­wa­ter cables; hos­tile weather, deep salt water up to 9,000 metres, fish­ing, wild­life, moun­tain­ous sea beds, tec­tonic plate shift and shark bites (even attack­ing cables). High tech survey ships gauge the depth, topo­graphy, slope, angles, sea bed type and then cable routes are estab­lished. The need for occa­sional retrieval for repair adds to the level of engin­eer­ing expert­ise required. There are 45 cable-laying ships glob­ally and owned by Tyco (who incid­ent­ally in my time were also man­u­fac­tur­ers of sur­gical stap­ling devices very famil­iar to your blog­ger, and which will have fired mul­tiple staples into at least one or two of our Probus mem­bers’ innards). 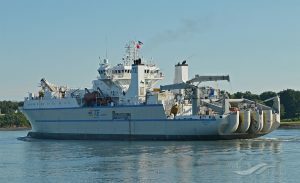 Some 100 pans of cables are in the hold of the cable ship, taking about a month to load, but suf­fi­cient to allow com­plete laying over a single voyage. At $80,000 a day (mil­len­nium prices) the expense of run­ning cable ships is enorm­ous. Ploughs dragged behind the ship cut trenches into the sea bed into which cables are pro­tec­ted in places where they would be vul­ner­able if left exposed, par­tic­u­larly close to shore. Ships carry a remote vehicle which can des­cend to 2,500 metres either to repair cable on the sea bed or retrieve the affected seg­ment for repair while elev­ated and sus­pen­ded by a series of buoys. Ships are very man­oeuv­rable so they can cope with pre­ci­sion cable lift­ing and laying, par­tic­u­larly in adverse con­di­tions. Nearby ships are warned to stay a mile clear to avoid col­li­sion with the cables as they are lifted. Some 10 or 11 cable sta­tions (BMHs) are dotted around the UK coast­line where beaches are gently slop­ing, and under con­stant sur­veil­lance. At 50-metres inter­vals along the cable are amp­li­fi­ers. These are powered with sev­eral thou­sand Kv run­ning through insu­lated copper cables incor­por­ated into the fibre optic assembly. The joints are vul­ner­able to damage. We saw a cross-sectional example of a typ­ical fibre optic cable and watched sev­eral excel­lent videos of its man­u­fac­ture Cable is ‘armoured’ where it is exposed to heavy ship­ping, such as in the Suez Canal. Cable pos­i­tion­ing is intric­ate, par­tic­u­larly near the shore, where the ship needs to anchor while the cable is lowered. Laying speeds are vari­able: 0.2km/hr (expens­ive) for armoured seg­ments when divers are in the water and up to 8km/hr (cheaper) when auto­mated in open water. A key stake­holder is the fish­ing industry. Mutual co-operation is advant­age­ous to both. Fishing boats are used for sur­veys in their own loc­al­ity, which is luc­rat­ive for the fish­er­men, and cables can be sited away from their fish­ing grounds, thereby lower­ing the risk of snag­ging by aban­doned fish­ing gear and anchors cut free in bad weather or from dredging. Most of the risks are close to shore from fish­ing (75 per cent), dredging, and anchors. Seismic activ­ity accounts for five per cent. A dam­aged cable drift­ing away can be loc­ated by voltage shift and its pos­i­tion is con­stantly sur­veyed. Cables get bitten by sharks, and we had an amaz­ing video demon­stra­tion of this. The latest gen­er­a­tion of cables are privately and often jointly owned, due to enorm­ous cap­ital costs involved. Cables fail after 20 or 25 years due to obsol­es­cence, repairs or the hos­til­ity of the envir­on­ment.